Non-runners often cite the potential for joint injury as a primary reason for not participating in this form of exercise. Running is a relatively high impact activity. Each time you stride, your foot hits the pavement with the full force of your body weight. Despite this, our Jacksonville orthopedic specialists say that the scientific research just doesn’t support the idea that running causes knee arthritis. 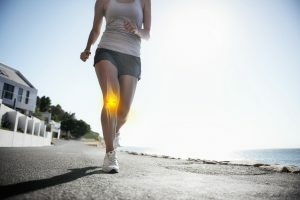 Does Running Really Cause Knee Arthritis? Arthritis occurs when the cartilage cushioning a joint gradually wears down. In the knee joint, there is a cartilage pad between the femur and the tibia (the large bone in the lower leg). Knee arthritis occurs when this cartilage wears down, causing the bones to impact one another and trigger pain. Many people worry that the repeated impact of running will wear down this cartilage. In fact, precisely the opposite is true. In a large study of nearly 75,000 runners, a researcher at the Lawrence Berkeley National Laboratory found no association between running and risk of osteoarthritis. Even marathon runners, who have significant impact on their joints, do not experience arthritis at a higher rate. Furthermore, active runners in the study actually had a lower risk of arthritis than inactive participants. To find out why, researchers studied the force exerted when walking versus running an equal distance. They found that although runners hit the ground with greater force, they contacted the ground less frequently and for a shorter period of time than when walking. As a result, the amount of force generated was the same whether a person walked or ran. Start slowly. The most common cause of running injury is over-training. Start slowly, alternating between walking and running, before gradually building your endurance. Focus on form. Your foot should strike directly under your knee, not in front of it. Keep your stride short and quick. Hands should be relaxed, with your neck and chest staying straight while running. Wear appropriate shoes. Visit a running store to get fitted for shoes that provide good support. Add a supportive insole if necessary. If your knees are hurting, arthritis could be the culprit. Contact your orthopedic doctor at Southeast Orthopedic Specialists for a comprehensive evaluation. We can recommend treatment options that will keep your joints healthy long term.